As Radio Holland Group (Rotterdam) ? 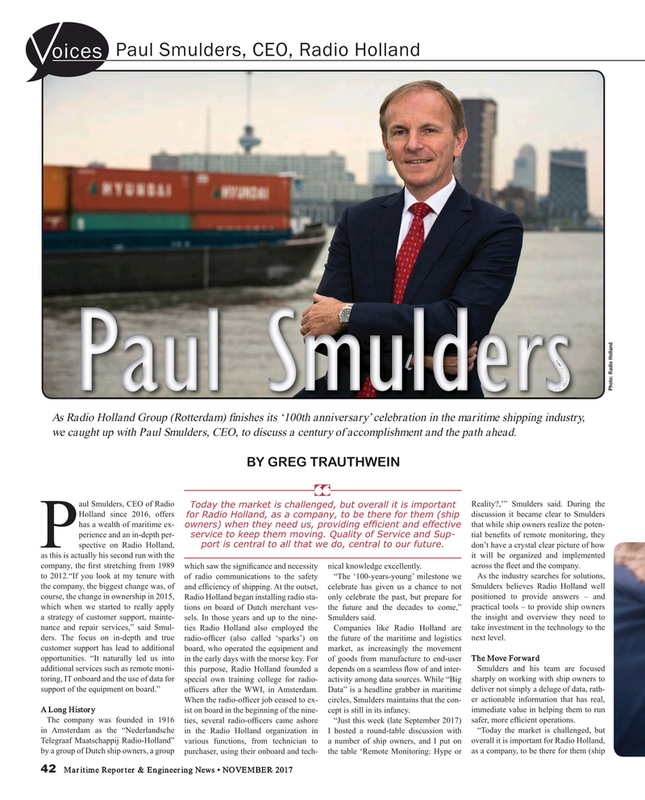 nishes its ‘100th anniversary’ celebration in the maritime shipping industry, we caught up with Paul Smulders, CEO, to discuss a century of accomplishment and the path ahead. Holland since 2016, offers discussion it became clear to Smulders for Radio Holland, as a company, to be there for them (ship has a wealth of maritime ex- that while ship owners realize the poten- owners) when they need us, providing ef? cient and effective service to keep them moving. Quality of Service and Sup- perience and an in-depth per- tial bene? ts of remote monitoring, they port is central to all that we do, central to our future. Pspective on Radio Holland, don’t have a crystal clear picture of how as this is actually his second run with the it will be organized and implemented company, the ? rst stretching from 1989 which saw the signi? cance and necessity nical knowledge excellently. across the ? eet and the company. to 2012.“If you look at my tenure with of radio communications to the safety “The ‘100-years-young’ milestone we As the industry searches for solutions, the company, the biggest change was, of and ef? ciency of shipping. At the outset, celebrate has given us a chance to not Smulders believes Radio Holland well course, the change in ownership in 2015, Radio Holland began installing radio sta- only celebrate the past, but prepare for positioned to provide answers – and which when we started to really apply tions on board of Dutch merchant ves- the future and the decades to come,” practical tools – to provide ship owners a strategy of customer support, mainte- sels. In those years and up to the nine- Smulders said. the insight and overview they need to nance and repair services,” said Smul- ties Radio Holland also employed the Companies like Radio Holland are take investment in the technology to the ders. The focus on in-depth and true radio-of? cer (also called ‘sparks’) on the future of the maritime and logistics next level.